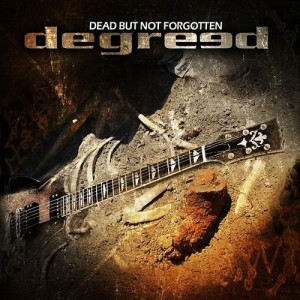 Degreed – Dead But Not Forgotten – Sun Hill Production – Release: June 19th 2015. Degreed was founded in 2005 and they have released two albums. The debut “Life, Love, Loss” saw the light of day in 2010 and the follow up “We Don’t Belong” was released two years ago. Both albums were critically acclaimed worldwide by the media. In 2014 the band was opening for Dan Reed Network on their Sweden tour, played Väsby Rock Festival and were invited as special guests to Machinae Supremacy’s European tour in Poland, Czech Republic and Germany. Now they present us their third album “Dead But Not Forgotten”. After 15 seconds of noise, this album kicks off with grandeur! A riff that sticks to your head, powerful drums and a clear presence of the keys. But when Robin opens his mouth I just can’t hide the Joker type smile on my face! I’m totally intoxicated by the raw edge on that voice. It gives the music a rougher edge. Just listen to the chorus, people! The guitar is present on the album cover and is the absolute master of the ring on this album. “The Scam” is a killer opener. “Face The Fact” shows the more melodic side of degreed. More keys, smoother vocals and layered background vocals set the tone! They introduce some poppy keys on “Shame On Me”, but soon those get the company of the guitar and the superb rhythm section. The song holds a heavy sounding break with a real shredding solo! The teasing between the keys and the guitar is back in the picture on the uplifting “Better Safe Than Sorry”. That crispy edge to the voice of Robin can be heard in its full glory during the break of “Love Me Love Me Not”. This guy rocks big time. The trio keys-riffs-voice is back on “Drama”! The break is pure melodic heaven with fast keys and tight riffs! The keys take over the scepter here! “Kill Your Darlings” is more rocking with a thunderous bass, Erik Martensson like riffs, a superb chorus and the always clearly present keys. And the short but furious guitar solo will blow you out of your socks! More happy sounds with many ‘wo-oh’ background vocals. With “Touch Of Paradise” degreed have found the way to transfer the ’80s sound into the new age. The remaining five songs are all in the same vein of the previous mentioned ones. So a huge presence of the keys, boosted with melodic but crunchy guitars and that vocal extravaganza from Robin! Degreed have hit the jackpot with their third album. The combination of the crunchy guitars from Daniel and the raw-edged vocals from Robin makes this collection of songs an extremely satisfying trip through melodic rock land. Mandatory purchase for all lovers of quality melodic rock, who have a soft spot for great guitars and superb vocals! And I believe there are a lot of those on our blue planet!